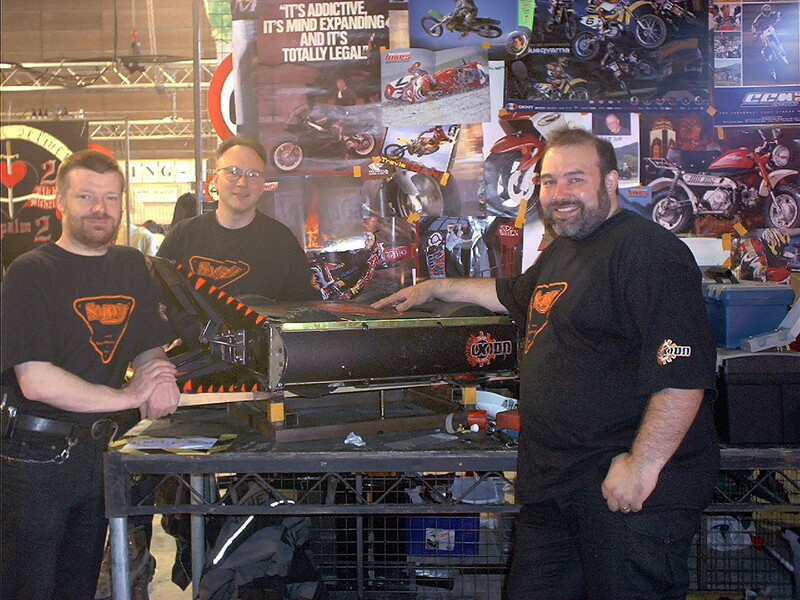 SMIDSY in the pits for series 5 of the UK Robot Wars TV show. From left to right: [Andy Pugh], [Robin Bennett], and [Mik Reed]. RIP [Mik]. SMIDSY, short for the insubstantial excuse heard by many a motorcyclist “Sorry Mate, I Didn’t See You”, is a robot that competed in several seasons of the British incarnation of the Robot Wars TV show. It wasn’t the most successful of machines because its weapons were slightly weedy compared to some of the competition, but it was one of the more robust and reliable platforms on the circuit at the time thanks to its combination of simple uncomplicated construction and extremely good design. I had the pleasure of being on the team that built and competed with SMIDSY and carry from it some of the more found memories from that decade. A few weeks ago I learned that a friend from that period in my life had died following an illness. I hadn’t seen [Mik] for a few years as our lives had drifted apart, but if we were to turn back the clock nearly a couple of decades you would find us and about twenty other fellow members of the Ixion British motorcyclist’s mailing list hard at work building a Robot Wars robot. The hard work and determination make this a great story. But even more so it’s fun to look back on the state of the art of the time and see some clever workarounds in a time when robot building was just starting to be approachable by the average engineer. Back at New York MakerFaire 2012, we noticed an amazing little steampunk quadruped robot walking around in the crowd outdoors. The robot was amazingly well executed, and had a unique ability to draw children over with it’s puppy like animations. It turns out this is [Drew’s] Little Walking Robot (AKA Puppy Bot). Puppy Bot has actually been around for quite a while. He was born from the spare parts [Drew] had left over after competing in Robot Wars and Battlebots. The robots in these competitions were often controlled by Radio Control plane or car transmitters. Most of these systems are sold as packs for an RC car or plane. In addition to the transmitter and receiver, the pack usually included a battery and 3 or 4 servos. Standard RC servos were much too weak for use in battle robots, so they remained in his parts box. On what [Drew] calls a slow weekend, he started putting the servos together, and ended up with a basic robot that could crawl around the room. After that the robot took on a life of its own. [Drew] improved the battery system, and added a microcontroller to automate the various gaits and animations. He brought the robot along with him to one of his battlebot competitions, and it took home the “Coolest Robot” award – even though it wasn’t actually competing!